The winning crew of Come Boating!’s Selkie in the East Coast Open Water Rowing Championships in Massachusetts were (from left) Tracy Cunning, Wiola Shaw, Ethan Shaw, Greg Stafford, Dan Waldron, Wes Reddick, and Rick Fitzsimmons, coxswain. Twelve strong rowers from Come Boating!, Belfast’s community boating organization, participated in the East Coast Open Water Rowing Championships in Plymouth, Mass., on Oct. 9. The organization’s two pilot gigs Belle Fast and Selkie were among 32 boats in several classes competing in a 4.1-mile course in Plymouth Harbor. The crew of men and women in Selkie took first place overall and in the Pilot Gig-Mixed class, and the women’s team in Belle Fast placed first in the Women’s Pilot Gig class and seventh overall. Contenders included pilot gigs from Plymouth, Buzzard’s Bay, Martha’s Vineyard and Gloucester, Mass., in addition to Belfast, as well as sliding-seat rowing boats, whale boats, dories and kayaks. The race course was a mile longer than had been billed, and a headwind from the northeast and choppy water on the 2-mile second leg of the course challenged racers. 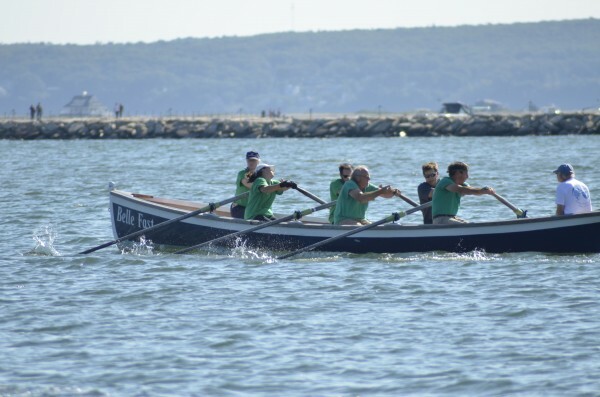 The Selkie crew took the lead in the first mile of its heat and maintained it, crossing the finish line with a time of 40:05, followed by a sliding-seat rowing boat in second place at 41:33 and the mixed crew pilot gig Real McCoy from Buzzard’s Bay in third place with a time of 42:08. In a heat dense with boats in various classes, the Come Boating! women in Selkie powered ahead of the women in the Gloucester gig Gannett, which tailed them for much of the race. Selkie crossed the finish line in 47:39, 43 seconds ahead of the Gloucester women. Mixed team members were Tracy Cunning, Wes Reddick, Greg Stafford, Ethan Shaw, Wiola Shaw and Greg Stafford, with Rick Fitzsimmons as coxswain. The women’s crew included Sally Faulkner, Amy Grant, Linda Hurley, Willy Reddick and Marnie Reeve, with Chris Gordon as coxswain. Belfast teams will travel to Hull, Mass., on Oct. 29 for the 5-mile Head of the Weir river race. Information about Come Boating!’s rowing and sailing programs is available at http://www. comeboating .org.